Pamper your skin with Genuine Virgin Aloe TriDerma Intense Fast Healing Skin Cream 4oz, model #09041. TriDerma is a line of true skin care products made with Certified Genuine Virgin Organic Aloe, moisturizers, and other carefully selected botanicals to target and help heal a wide variety of skin problems. The Genuine Virgin Aloe TriDerma Intense Fast Healing Skin Cream 4oz is a multi-purpose, Cortisone Free skin repair cream that provides fast healing for minor to severely damaged skin, plus hard-to-heal skin irritations. Multi-purpose, "Must Have" cream for cuts, rashes, scrapes, bug bites, athlete's foot, dry damaged hands. Ideal for those hard to heal sores, where you have tried everything else and it didn't work. Great on pets for sores, dry elbows, hotspots, itchy skin or areas where skin is breaking down. If you could have only 1 cream on a deserted island, this is the cream. Its many uses makes it a customer favorite. It can be used for rashes, cuts, scrapes, blemishes, burns, sunburn, pressure sores, skin breakdown, post surgical, laser, eczema, psoriasis, dry cracked skin and other minor to severely damaged skin. It contains our proprietary concentrated blend of AP4 Genuine Virgin Organic Aloe Complex and Zinc PCA, Vitamins A, B, D, E and the most advanced healing ingredients available. It is powerful, yet gentle enough to use as an everyday moisturizer for face and body. 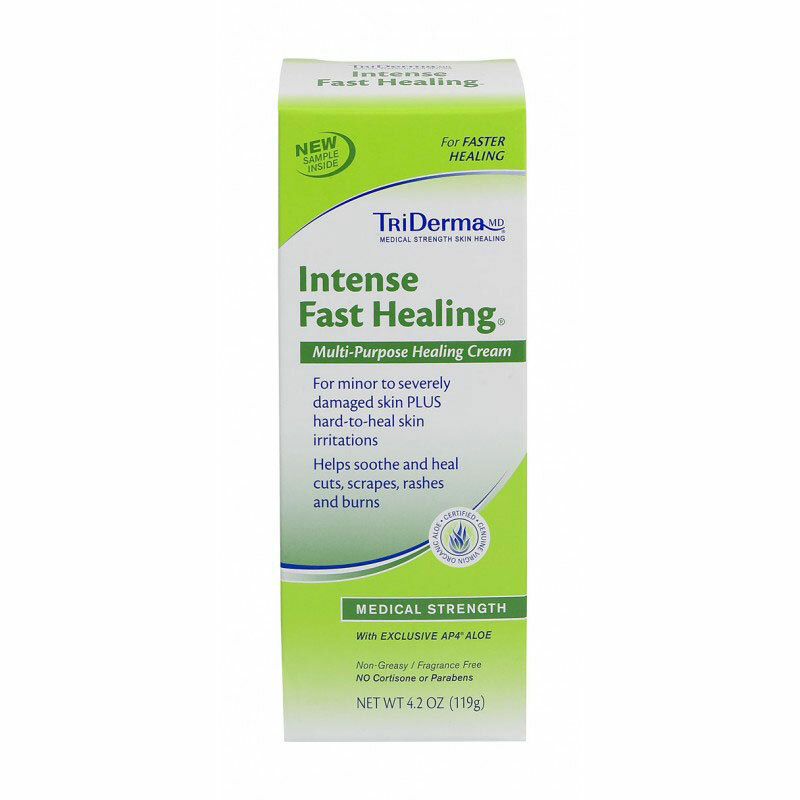 If you've tried prescriptions and other products for those hard to heal rashes or skin irritations with no luck, Intense Fast Healing Cream gets the job done. This is the perfect skin repair cream. Non-greasy, fragrance and paraben free. Contains NO Cortisone - can be used head to toe, as often as needed. Aloe Barbadensis (AP4 Genuine Virgin Organic Aloe Vera) Leaf Extract, Tocopherol Acetate (Vitamin E), Squalane, Sodium Pca, Zinc PCA, Beeswax, Petrolatum, Allantoin, Dimethicone, Avena Stiva (Oat Protein), Panthenol (Pro Vitamin B5), Retinyl Palmitate (Vitamin A), Cholecalciferol (Vitamin D3), Sodium Hyaluronate, Caprylic Capric Triglyceride, Polysorbate 60, Cetearyl Alcohol, Cetyl Alcohol, Triethanolamine, IPBC, Phenoxyethanol, Disodium Edta.